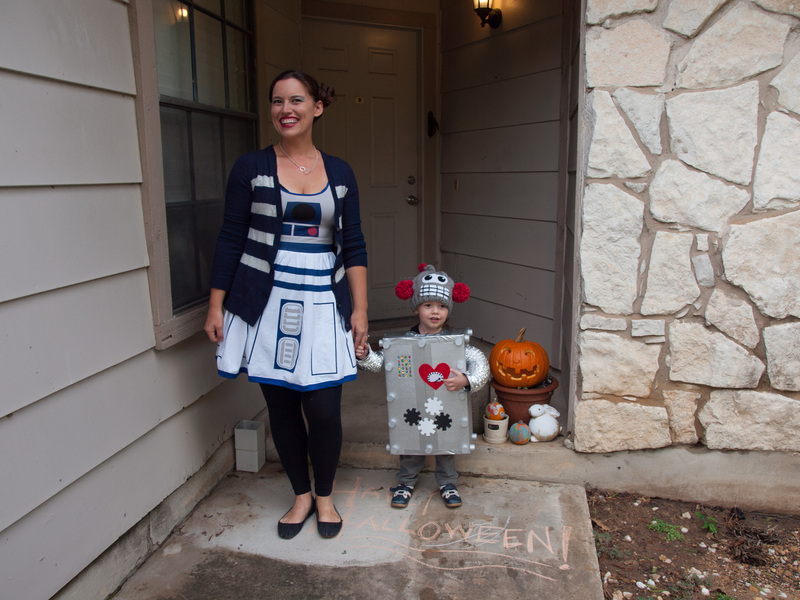 How often in life will I be asked to make a robot costume? 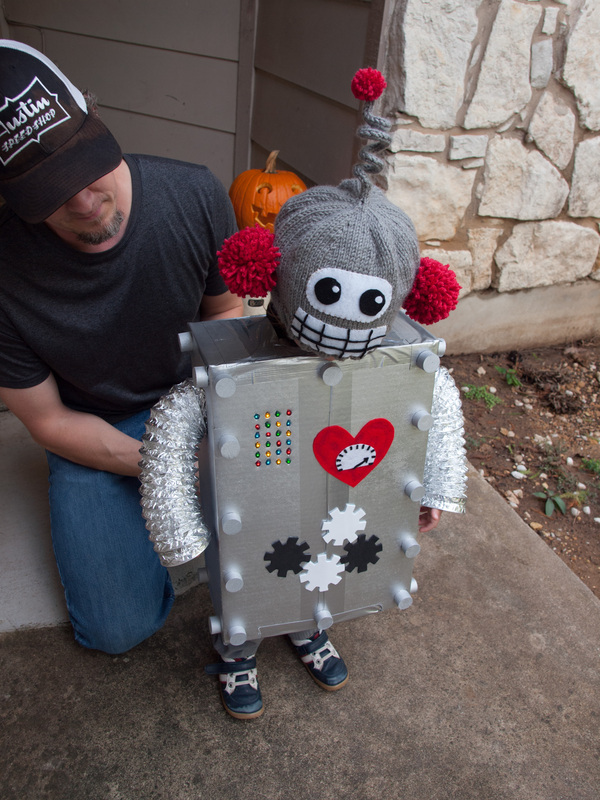 When my 2 year old declared this is what he wanted to be for Halloween, my heart sang. To say I had fun assembling this would be a gross understatement. Luckily, I had a box of just the right size laying around. Cut a few holes and boom. 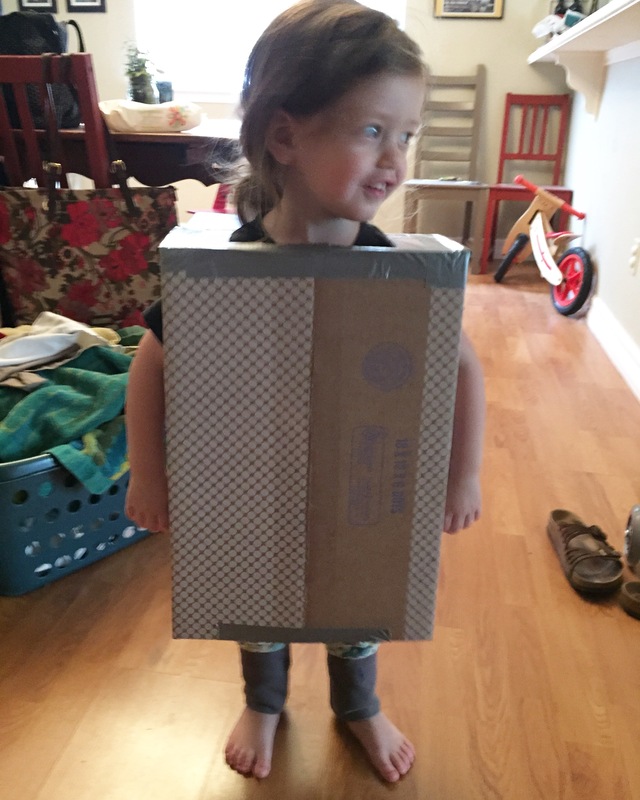 Toddler in a box. Happy toddler in a box! 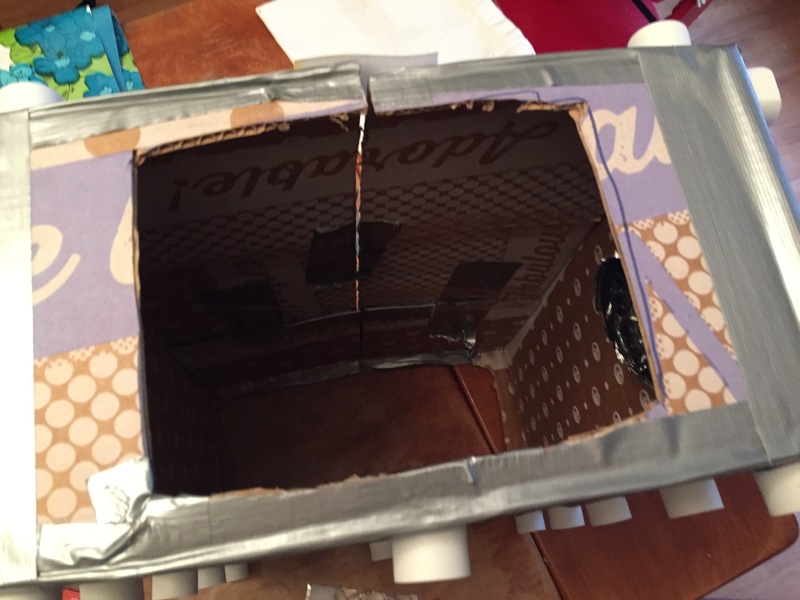 I reinforced the seams with duct tape and left the back open to ease cramming helping my kid inside. I attached velcro tabs to help keep it closed once he was safely encased. I found some foam pegs at Michaels and, once cut in half, they made the perfect rivets! I attached them with foam glue at the corners and mid points, to make things look a little more robot-y. Next up – spray paint! My hubs is really good at using spray paint. (Juvenile delinquent? Methinks he protest too much.) Painted the whole thing up a shiny silver right quick. Next, I punched some holes for the battery powered mini Christmas lights I had scored. (Whee!) I pulled out some felt to make a heart-o-meter and some thin foam was perfect for cutting into gears. What’s a robot without some wacky arms? Home Depot came through with some 3″ wide laundry vent tubing stuff. (Meh. I could look up the real name or you could trust me on this.) I stuck these in the holes I had cut, and with a little duct tape over the sharp ends, they were good to go! But, I knew I had another challenge ahead of me. There was no way he would put up with a box on his head for longer than 5 minutes. So, why not knit a robot head instead? I mean, because who doesn’t automatically jump to this solution? No? No one? Well, fine. But, if you’re a knitter you will totally back me up on this. I used the Be Loving pattern (ravelry link) for the hat construction – when I got to the end, I decreased to 3st and knit i-cord until it looked long enough to be twisted into a spring, then bound off. I made one small pompom for the top and two large pompoms for the sides and sewed them on. I cut a length of craft wire (16 gauge, I think? ), rounding the sharp ends, then stuck it inside the i-cord. I stitched the opening (top of beanie, bottom of spring) closed. The face is made of felt pieces I cut and glued, then I stitched those large pieces on with embroidery floss. And, trick or treating was a HIT. He delighted in announcing to all his neighbors that he was a ROBOT! He loved staying up late and seeing all the big kids in their costumes – and saying hello to everyone on our street. It was really the best night ever.